Some artists have the ability to imagine something, and then create it. My creative process is sometimes backwards. I will get the urge to paint, but have no clue of what to do. 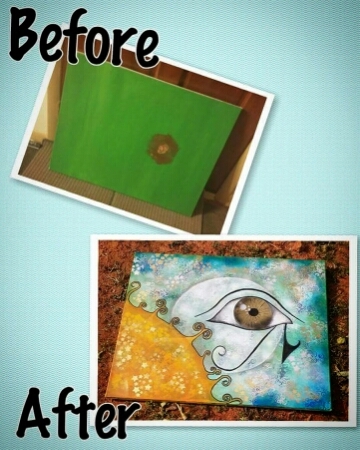 This painting is a cover up to a painting my son began, but lost his vision. The only vision I had was to create something beautiful. Even though I didn’t know what to create, I bravely began covering the background. After the background was finished, I finally felt what to do. I really enjoy these types of open idea paintings because they always reflect something deeper than I could have imagined! Artist: Original spray paint and acrylic painting by Maya Perez. If you have any questions, please ask. Customer satisfaction is our main goal. We speak English and Spanish. 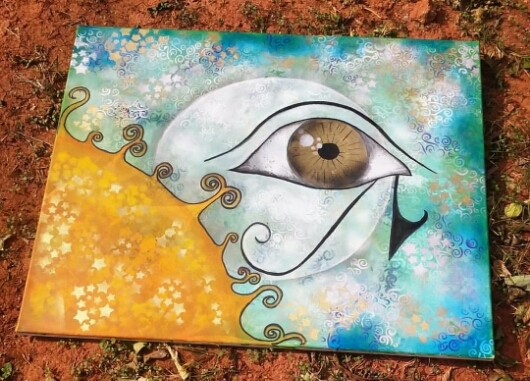 This entry was posted in Art For Sale and tagged acrylic, art, art for sale, artist, eye of horus, moon, mystical, painting, soul, sun. Bookmark the permalink.